Coolest moment in ALL of Berserk ? 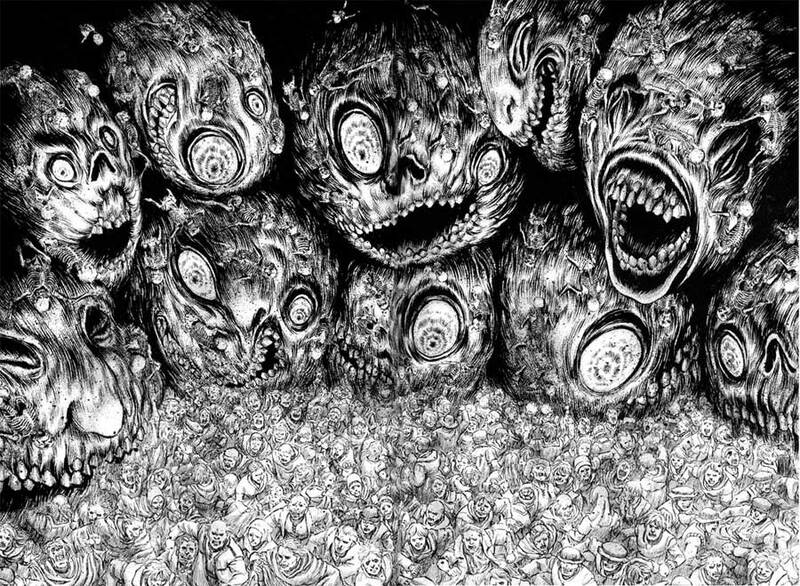 What would your best/most badass/most emotionally powerful moment be in all of Berserk (any arc) ??? Mine would have to be Griffith collapsed in the snow after Guts abandons him. That or when Serpico takes a swing at Daiba. Or even when he stands before Zodd. As far as "badass" or a spectacle, I think it's a tie between Skull Knight's surprise entrances: at the Eclipse and on top of Ganishka. But my favorite moment in the series is still when Griffith faces Guts after making his decision, and with a peaceful smile on his face, makes the sacrifice. These days guess I'll pick the assassination of Julius and Adonis. It's probably the moment I think about the most. I even like both anime adaptations of the scene. In terms of big epic spectacle like Walter said, I'd go with the death of Ganishka and the subsequent surprise appearance by Skullknight. 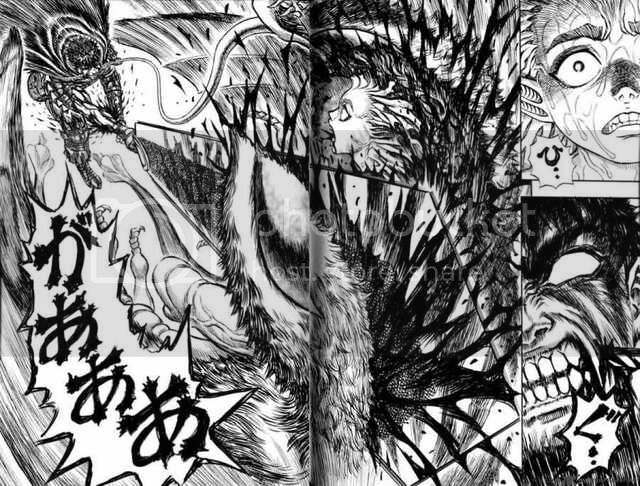 The entire sequence, including the battle and the brief flashback of Ganishka's life, and then the panels with Skully appearing and Zodd caught off guard with Femto in his God Hand form is flawlessly done. Honestly though another top "cool" moment is when Guts dons the armor for the first time and attacks the force sent to destroy Flora. I mean, it's just the coolest moment of the series. Doesn't get much better than that. Runner up - The entire sequence towards the end of the Sea God episodes where Guts has his showdown with the massive creature by entering it and fighting his way through it's innards. That was a unique challenge for Guts and not the type of thing you get to see in much these days. As a young child, I was terrified when Pinocchio rescues Gepetto from Monstro the whale. That thing gave me nightmares and it stuck with me. It was great to see Miura utilize that in Berserk. Certainly a cool scenario for me. Without a doubt what happened on top of Ganishka. Seeing that surprise Skullknight appearance, Femto's counter and the whole sequence of events after completely melted my mind. The fact that a series 34 books in could still blow me away the way that sequence did was incredible. Especially as a series that already had a million amazing moments. Okay, I guess a close second would be the finale of Guts' fight with Mozgus. Guts is on the ropes, nothing he does can even scratch the maniac, he doesn't know what to do...then he notices something. A chink in Mozgus' armor. He moves forward, takes a savage beating, gets thrown face-first into the masonry. Mozgus gears up to finish him off, but Guts only smirks and taunts the zealot, ending with: "Your faith might be your weakness, but on the other hand, it's where you're most vulnerable." And that's when we see the cavity in Mozgus' chest, where he keeps the remains of the Scripture, is filled with bombs. BOOM! They explode, blasting a hole open in Mozgus' chest@! And as the inquisitor is rearing back in pain, Guts takes advantage of the opportunity and attacks, striking the wound again and again and again. And just before he impales the beast on his sword, he lets out this awesome line: "If you see God, you tell him this: Leave me the hell alone!" Oooh, gets me every time I read it! 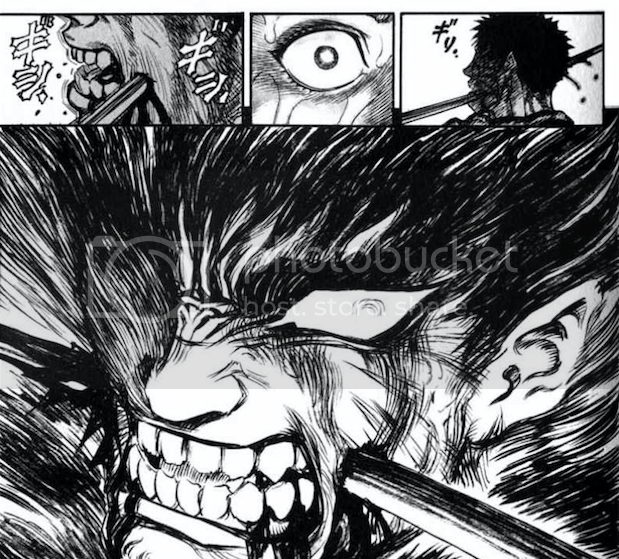 Badass Category: When Guts cut off his own arm with a broken blade. Good call. One of mine would be the moment when Guts fights the possessed children on the mountain. The look on his face, totally gone in that moment. It got me. Far too many to name, but I've always liked the image of a battered Guts, crawling towards a looming, oppressive Femto. Chapter 110, right after Guts starting fighting with the Elves of Misty Valley at the end of the chapter theres this epic image of Guts after he lit all the eggs of fire. Literally made that all my profile pics. 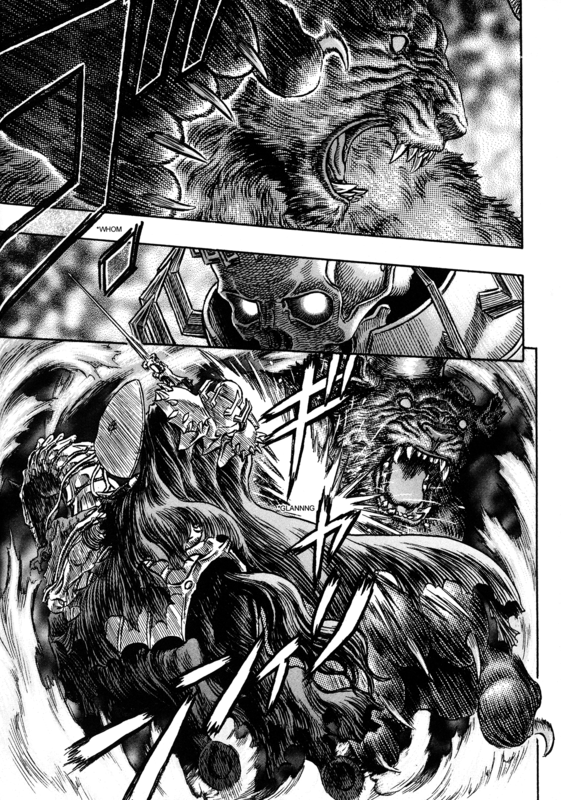 This moment has recently been a favorite of mine, Skull Knight and Zodd in his Apostle form duking it out. Between the top notch art, even in the context on the series as a whole, and the sheer natural disaster of these two super-powers clashing together it certainly ranks high on the coolness chart. I will always enjoy the moment Griffith confronts The Queen of midland and the nobles from the base of the tower while it burns as he tells her off and gloats. It is one of Griffith's most calculating and coldest moments that he just gave zero fucks about her status as the most powerful woman in the kingdom being the Queen and engineered her demise regardless of that. When he takes down his hair and and looks up at the tower I was amazed.